If you’ve browsed @carouselandfolk or the Carousel + Folk storefront in South Minneapolis’s Longfellow neighborhood, you have a good sense of the owners’ style: a warm blend of vintage/midcentury/boho. The same aesthetic reigns in Lindsey and Mike Cason’s home, though the rooms are more tightly edited. 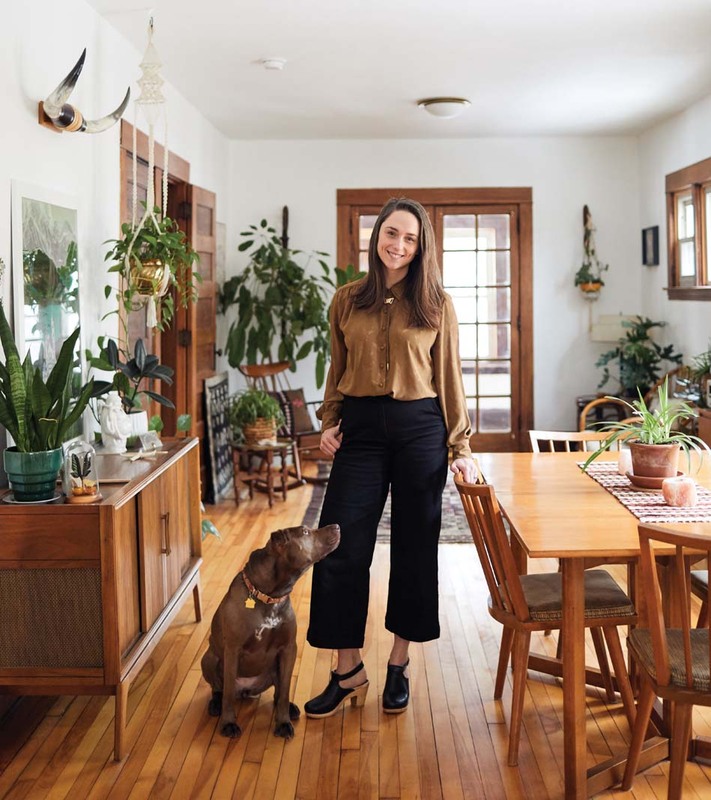 Lindsey, with her dog Ginger, in her bungalow-style home filled with vintage wares and accented with plenty of growing plants. Lindsey started thrifting and antiquing while studying graphic design and branding in Chicago, and quickly thereafter launched an Etsy shop. Mike shares the passion and specializes in refurbishing antique typewriters. Most of the homes in the neighborhood lacked the storage they needed for their online stock (this was before they opened the brick-and-mortar store in June 2018). But eventually they came across a bank foreclosure: A 1914 bungalow with a circa-2000 addition at the back—which gives them some 2,000 square feet, a double garage, and a full basement. 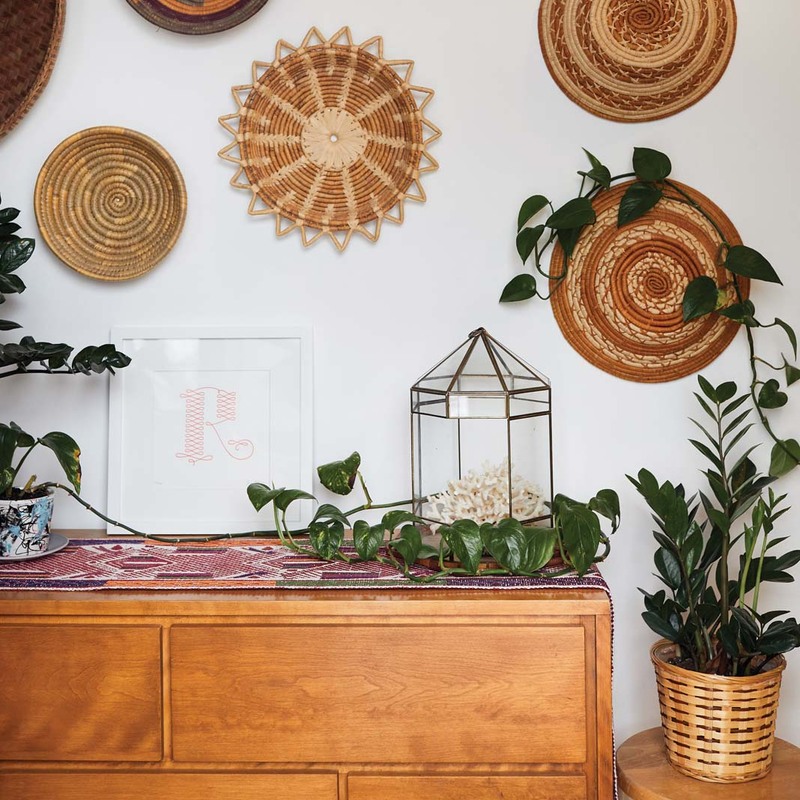 A wall of woven baskets, similar to the ones Lindsey carries in her shop, adds to the boho-chic aesthetic of her home. The furnishings are 95-percent secondhand and rotate regularly, thanks to Lindsey’s nonstop hunt for Carousel + Folk stock. Only very particular treasures find a home here: the late ’70s Henredon sectional, a striking midcentury bedroom set, the doggy-motif cookie jar that holds treats for pitty Ginger. 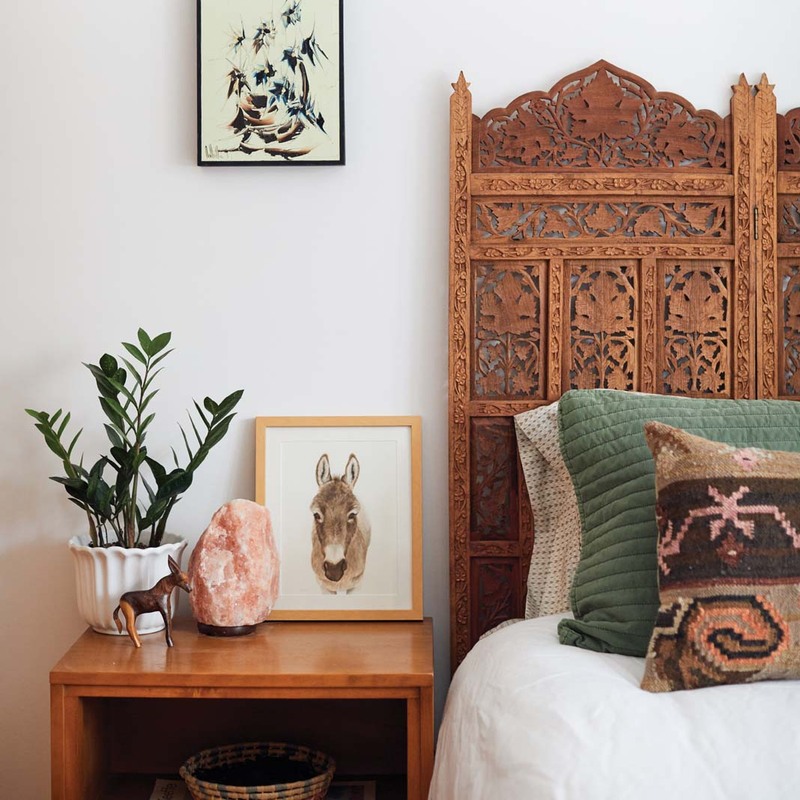 A refurbished room divider makes for a unique headboard in the couple’s bedroom. Lindsey and Mike have steadily completed home improvements, both cosmetic and substantial. “We redid the kitchen,” she says, pointing out freshly painted white cabinets, black hardware, tile backsplash, and open shelving. They also added trim and installed repurposed maple flooring in the addition to match the floors in the rest of the house. 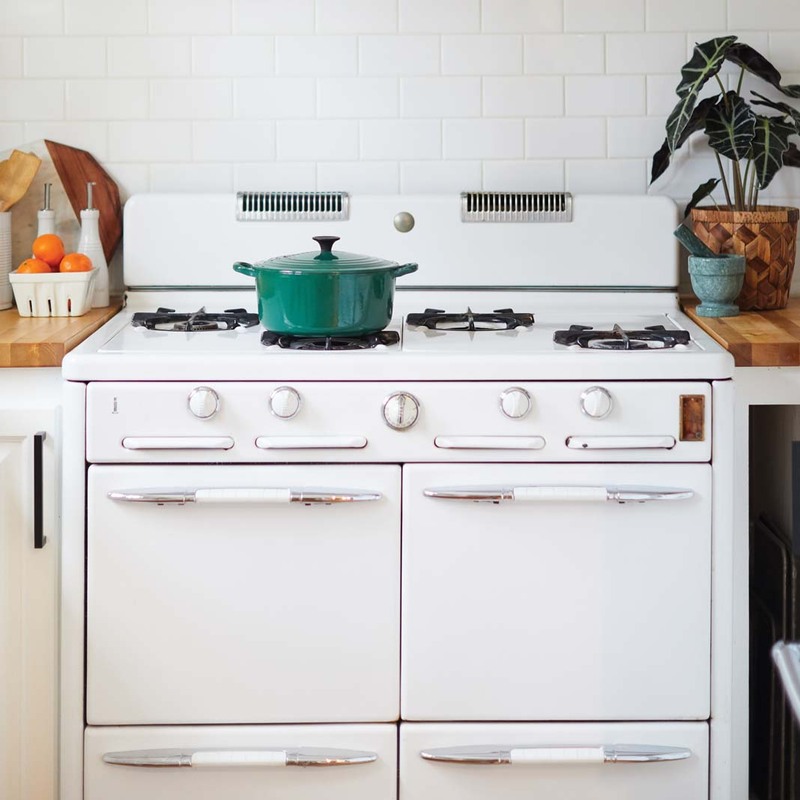 A vintage stove that belonged to Mike’s grandmother is now center stage in the couple’s updated kitchen. He’s also a chef. He opened Cason Italian Eatery in February, continuing a family tradition of Italian restaurateurs. Lindsey now handles Carousel + Folk solo while she develops a new, shoppable website. “Things sell so quickly, it’s hard to tell if they’re worth listing,” she says. Not a bad dilemma to have. What are your favorite shopping haunts? It’s rare that I go out and shop for myself. A lot of what is in the house is what I’ve collected just because I’m out sourcing. I do love E’s Emporium on Minnehaha. When you go in there, it’s such a good feeling. I get style inspiration from the Instagram feeds of a couple shop owners: @6thanddetroit, a vintage shop in Long Beach, and @joandjune in Tulsa. I also get a lot inspiration from vintage design books and plant books from the ’70s. I like to hang out at home! But when we go out and grab a bite to eat, we like the Blue Door, Young Joni, and Hi-Lo Diner down the street.